All righty then, I participated in Dewey's 24-Hour Readathon yesterday, which is almost no different than any other Saturday, since I read a lot anyway! On Saturday mornings I have a ritual. After breakfast, I use my Tune-In app to listen to The Wolf 102.7, which broadcasts Casey Kasem's American Top 40, one of the old shows from the 1970s. And then I read for at least 2 hours, comics, books, whatever. I did take the excuse to stay at home a little more and read. Unfortunately saying there is a "read-a-thon" is not a good enough excuse to get out of the regular Saturday chores. Appetizer A: New Avengers #1 by Al Ewing and Gerardo Sandoval, which I read on the Marvel Unlimited iPad app (so glad I finally reached the point where most of the new issues coming out are new to me). I like Al Ewing and think he's done some interesting stuff for Marvel. He's always figuring out inventive stories and bringing in multi-ethnic characters. This team operates under the leadership of Sunspot who has created a new AIM on the old Hydrobase from Roger Stern's run. 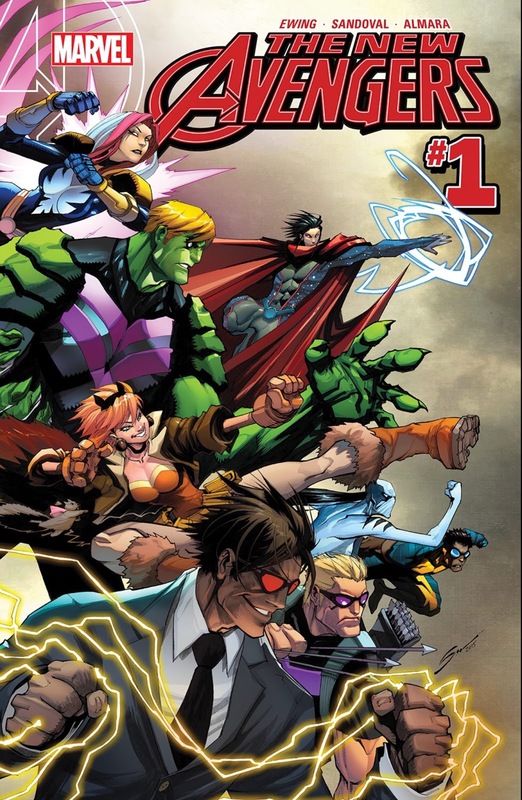 The first story was fun and features a villain who survived the end of Secret Wars #9. I will keep reading this series. Appetizer B: Uncanny Avengers #1 by Gerry Duggan and Ryan Stegman. Interested in this because of Stegman's artwork, which I liked on Wolverine and the X-Men, where at times he seemed to be channelling Art Adams. In this series Stegman's artwork is more cartoony, almost like a Mad Magazine parody. Partially this is a result of the story by Gerry Duggan and the fact that Deadpool is front and center part of this team--since he drives sales. I have never read a Duggan Deadpool story and probably won't after this, I didn't care for any of the character moments, they just seemed like different characters than what I have known before. Wasn't that crazy about this one, I may browse it on MU but I won't be a regular reader. Main Course: The Bands of Mourning by Brandon Sanderson. Which I am reading on my Kindle but took this iPad photo because it is more colorful. I am big Sanderson fan, this extension of the Mistborn world is fascinating. It's about Wax and Wayne, two lawmen who live in the world of Mistborn just as it enters the Industrial Age, somewhat like the TV show the Wild Wild West. The magical system established in the original Mistborn trilogy still exists, but Sanderson manages to invent new situations around that as time progresses. I read a big chunk of this but didn't finish it yet. Sanderson could write a 10 volume series with Wax and Wayne as far as I am concerned, I love these characters and this Western world combined with fantasy powers. Dessert: Howard the Duck Omnibus! I bought this back in December, when Rich Johnston said on Bleeding Cool that this was about to go out of print. I snagged one for less than $50, thinking it might be good as a speculation item. However the lure of Howard became too great and I decided to keep it, so the read-a-thon was a good excuse to finally unwrap it. I made a good decision to keep it, the early Howard stories look fantastic in these oversized pages. I will do a slightly bigger review of this over on Giant-Size Marvel. I didn't do as well as many people on Twitter, some of them managed to read 2-3 books and truly stay up 18 hours or more just reading! Not possible for me, unless I am sick or it's raining outside with nowhere to really go. Why do we need Readathons? Don't people who are passionate about reading do it anyway? I think it is good to have a day or two where we celebrate both books and reading. Enthusiasm kindles infection in other people, especially younger people, who are still reading despite all the electronic distractions around. I've become enamored of tumblrs like Polly and Books or A Literary Escape, which celebrate reading, libraries, coffee, and bookshelves with nice photography. Important to keep this fire going, in an age where bookstores are more endangered than ever. This weekend, one of my favorite used bookstores, Bookbuyers in Mountain View just closed. I bought so many SF books and graphic novels there, also traded tons of stuff I didn't want anymore. In March, Lee's Comics shut down their store in San Mateo, leaving us with no comics shops in the the North Peninsula (the closest one for me is Coastside Comics in Pacifica, a fine store but a bit of a drive). There are many reasons for these closures and I think that people not reading enough is not the problem - it's the rising rents and other things happening to the local economy here - but still I feel like when a bookstore disappears, it's like someone tore down my church / temple. Without a church I need online communities like GoodReads or these Read-A-Thons! The next read-a-thon is schedule for October 22, 2016. Let's hope it rains that day! Nuff Said.